Motocross first evolved in the U.K. from motorcycle trials competitions, such as the Auto-Cycle Clubs's first quarterly trial in 1909 and the Scottish Six Days Trial that began in 1912. When organisers dispensed with delicate balancing and strict scoring of trials in favour of a race to become the fastest rider to the finish, the activity became known as "hare scrambles", said to have originated in the phrase, "a rare old scramble" describing one such early race. Though known as scrambles racing in the United Kingdom, the sport grew in popularity and the competitions became known internationally as "motocross racing", by combining the French word for motorcycle, motocyclette, or moto for short, into a portmanteau with "cross country". The first known scramble race took place at Camberley, Surrey in 1924. During the 1930s the sport grew in popularity, especially in Britain where teams from the Birmingham Small Arms Company (BSA), Norton, Matchless, Rudge, and AJS competed in the events. Off-road bikes from that era differed little from those used on the street. The intense competition over rugged terrain led to technical improvements in motorcycles. Rigid frames gave way to suspensions by the early 1930s, and swinging fork rear suspension appeared by the early 1950s, several years before manufacturers incorporated it in the majority of production street bikes. The period after World War II was dominated by BSA, which had become the largest motorcycle company in the world. BSA riders dominated international competitions throughout the 1940s. In 1952 the FIM, motorcycling's international governing body, set up an individual European Championship using a 500 cc engine displacement formula. In 1957 it was upgraded to World Championship status. In 1962 a 250 cc world championship was established. In the smaller 250 cc category companies with two-stroke motorcycles came into their own. Companies such as Husqvarna from Sweden, CZ from the former Czechoslovakia and Greeves from England became popular due to their lightness and agility. Stars of the day included BSA-works riders Jeff Smith and Arthur Lampkin, with Dave Bickers, Joe Johnson and Norman Brown on Greeves. By the 1960s, advances in two-stroke engine technology meant that the heavier, four-stroke machines were relegated to niche competitions. Riders from Belgium and Sweden began to dominate the sport during this period. Motocross arrived in the United States in 1966 when Swedish champion, Torsten Hallman rode an exhibition event against the top American TT riders at the Corriganville Movie Ranch also known as Hopetown in Simi Valley, California. The following year Hallman was joined by other motocross stars including Roger DeCoster, Joël Robert, and Dave Bickers. They dominated the event, placing their lightweight two-strokes into the top six finishing positions. Motocross began to grow in popularity in the United States during this period, which fueled an explosive growth in the sport. By the late 1960s Japanese motorcycle companies began challenging the European factories for supremacy in the motocross world. Suzuki claimed the first world championship for a Japanese factory when Joël Robert won the 1970 250 cc crown. The first stadium motocross event took place in 1972 at the Los Angeles Coliseum. In 1975 a 125 cc world championship was introduced. European riders continued to dominate motocross throughout the 1970s but, by the 1980s, American riders had caught up and began winning international competitions. During the late 1970s and early 1980s, Japanese motorcycle manufacturers presided over a boom period in motocross technology. The typical two-stroke air-cooled, twin-shock rear suspension machines gave way to machines that were water-cooled and fitted with single-shock absorber rear suspension. In the 1990s, America's leading motorcycle sport governing body, the AMA, increased the allowable displacement limit for four stroke powered machines in the AMA motocross championship, due to the low relative power output of a four stroke engine, compared to the then-dominating two stroke design. By 1994, the displacement limit of a four stroke power motocross bike was up to 550 cc in the 250 class, to incentivize manufactures to further develop the design for use in motocross. By 2004 all the major manufacturers had begun competing with four-stroke machines. European firms also experienced a resurgence with Husqvarna, Husaberg, and KTM winning world championships with four-stroke machinery. 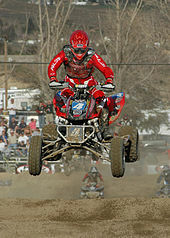 The sport evolved with sub-disciplines such as stadium events known as supercross and arenacross held in indoor arenas. Classes were also formed for all-terrain vehicles. Freestyle motocross (FMX) events where riders are judged on their jumping and aerial acrobatic skills have gained popularity, as well as supermoto, where motocross machines race both on tarmac and off-road. Vintage motocross (VMX) events take place - usually[quantify] for motorcycles predating the 1975 model year. Many VMX races also include a "Post Vintage" portion, which usually includes bikes dating until 1983. The AMA Motocross Championship begins in mid May and continues until late August. The championship consists of twelve rounds at twelve major tracks all over the continental United States. There are three classes: the 250 Motocross Class for 0–125 cc 2-stroke or 150–250 cc 4-stroke machines, the 450 Motocross Class for 150–250 cc 2-stroke or 251–450 cc 4-stroke machines and a Women's Class. The Maxxis British Motocross Championship is the main UK off-road competition and organised into classes of MX1 and MX2. MX1 is for 250 cc to 450 cc (fourstroke) and MX2 for 175 cc to 250 cc fourstroke motorcycles. In 2007 an additional youth class, the MXY2 class, was added to the programme at selected rounds. Freestyle Motocross (FMX), a relatively new variation of supercross started by the South African champion, Marco Urzi, does not involve racing and instead it concentrates on performing acrobatic stunts while jumping motocross bikes. The winner is chosen by a group of judges. The riders are scored on style, level of trick difficulty, best use of the course, and frequently, crowd reactions. FMX was introduced to the X Games and mainstream audiences in 1999. Supermoto uses motocross bikes converted for racing on tracks consisting of three sections: flat dirt, dirt obstacles, and paved road. The bikes have special road-racing tires with grooved tread to grip both the pavement and dirt. Some tracks for these race events have jumps, berms, and whoops like motocross tracks. For special events, the Supermoto track may incorporate metal ramps for jumps that can be disassembled and taken to other locations. Supermoto races may take place at modified go-kart tracks, road racing tracks, or even street racing tracks. There are also classes for children, such as the 85 cc class. Supermoto began in the US the late 1970s when TV journalist Gavin Trippe envisioned a racing event that would prove who the best motorcycle racer was. From 1980 to 1985, he organized a yearly event called "The Superbikers", which pitted the top riders from three disciplines, flat track, road racing, and motocross against one another on modified bikes raced on special tracks on the television show. Its first exposure to a wide audience came on the American television program ABC's Wide World of Sports in 1979. After 1985, the sport declined and received little exposure in the US, but in Europe, it started gaining popularity, and in 2003 it was revived in the US, when the name became Supermoto. Supercross is a cycle racing sport involving specialized high-performance off-road motorcycles on constructed dirt tracks with steep jumps and obstacles. Compared to regular motocross, supercross tracks generally have much shorter straights and tighter turns. Professional supercross contest races are held almost exclusively in professional baseball and football stadiums. The supercross season takes place during the winter and spring months, with races in a different city every weekend. There are 17 races in the AMA Supercross Championship schedule, normally beginning in Anaheim, California, and ending in Las Vegas, Nevada. The 250 cc class is split into two series, east and west. The 450 cc class has one large series with events across the US and Canada. Sidecar racing, known as Sidecarcross has been around since the 1950s but has declined in popularity since the mid‑1980s. This variant is common in Europe, with a few followers in the United States, New Zealand, and Australia. The premier competition, the Sidecarcross World Championship, is contested on European tracks only and almost exclusively by Europeans. It is very physically demanding, especially for the passenger. This is reflected in most in the Swedish term for passenger, burkslav, roughly translated as trunk/barrel-slave. This name comes from the early sidecars which resembled road motorcycle sidecars and not today's platform. The major frame builders today are VMC, BSU, AYR, EML and Woodenleg. Ordinary engines can be used, but size matters and two engines purpose built for sidecars exist, Zabel (Germany) and MTH (Austria) are most common. Four-strokes are becoming more common, usually KTM (Austria). Originally, there was only one way to acquire a pit bike. A rider would buy a child's minibike, usually a Honda CRF 50 or Kawasaki KLX110, and apply all the necessary upgrades and modifications to build a competitive pit bike. Of course, a rider could also buy a used bike. Since 2004, manufacturers like Thumpstar have begun designing, manufacturing, importing, and selling already complete pit bikes. These bikes are less expensive, and require less time to complete. TM (Italy), TM holds the largest market share for motocross bikes, outside the major six. Motocross is governed worldwide by the Fédération Internationale de Motocyclisme (FIM), with federations in many nations. ^ a b c d e "History of Individual supercross World Championships" (PDF). fim-live.com. Retrieved 11 October 2011. ^ "The Powerhouse MX Nations". Google Books. Retrieved 28 February 2016. ^ "Edison Dye and his Flying Circus". motorcyclemuseum.org. Archived from the original on 7 May 2012. Retrieved 11 October 2011. ^ "Corriganville/Hopetown Motorcycle Races". employees.oxy.edu. Archived from the original on 27 September 2011. Retrieved 12 October 2011. ^ "Boom Time: American Motocross in the 1970s". motorcyclemuseum.org. Archived from the original on 4 April 2012. Retrieved 11 October 2011. ^ a b "The young Americans". motorcyclemuseum.org. Archived from the original on 4 April 2012. Retrieved 11 October 2011. ^ Counting Strokes. American Motorcyclist. Books.Google.com. June 1997. Retrieved 2 October 2010. ^ "Vintage Motocross". American Historic Racing Motorcycle Association. Archived from the original on 24 September 2011. Retrieved 18 April 2013. ^ Paetow, Stefan (10 March 2008). "Sun Shines On Maxxis British Motocross Championship Opener". Archived from the original on 2 December 2010. Retrieved 9 October 2010. ^ "ATV Motocross". ATV Motocross. 1 January 2013. Retrieved 6 February 2013. ^ "Championship Mud Racing". Championship Mud Racing. 29 October 2012. Retrieved 6 February 2013. 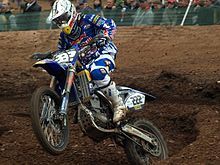 Wikimedia Commons has media related to Motocross.